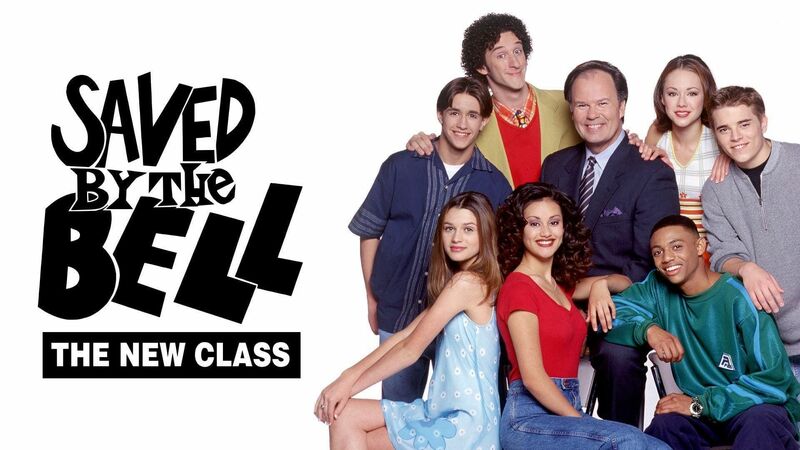 Here's where to watch every episode of Saved by the Bell: The New Class season 2. Mouseover or tap an episode to see where to stream it. Click or tap the play icon to stream it on the best available service. The Return of Screech Sep 10, 1994 Former Bayside High pupil and current college student Samuel ""Screech"" Powers returns to his alma mater as an administrative assistant to Mr. Belding. A new student from Switzerland, Brian Keller, is attracted to Rachel. Rachel ruins her mom's $700 jacket and the gang helps her come up with a plan to replace it, a plan which makes Screech an unwitting participant. All Play and No Work Sep 10, 1994 Mr. Belding and Screech are summer managers at the Palisades Hills Country Club. Screech promptly hires the gang from Bayside to work there for the summer, and they just as promptly incur the wrath of Mr. Harrington, the club's manager. Screech falls for Mr. Harrington's daughter Alison. Let the Games Begin Sep 17, 1994 The annual competition pitting the staff of Pacific Palisades Country Club against Mr. Harrington and the guests is coming up. Mr. Belding injures himself, so Screech must take his place in a golf match against Harrington, who is determined to win at all costs. Lindsay and Megan have to teach Tommy D to swim so he can fill a spot on the relay team. Also, Brian has to find a way to convince Rachel to stay at the Club after she learns her college boyfriend, David, won't be coming out for the summer. Bloody Money Sep 17, 1994 Megan is running a blood drive and while contributing to it, Screech falls for the pretty nurse Penny Brady. Meanwhile the gang needs to find a chaperone for their camping trip. Brian comes up with a scheme to get Screech to do the job, but first he must get him a date with Nurse Brady. Squash It Sep 24, 1994 The kids operate a booth at the Bayside Carnival. Bobby is threatened by a bully who likes Megan. For protection, he takes karate lessons from an unlikely teacher--Screech! Brian's Girlfriend Sep 24, 1994 In an effort to make Rachel jealous and stop her from thinking about her missing boyfriend David, Brian begins hanging out with the club's pretty tennis instructor, Karen. Also, the Bayside gang competes in a ""tip-athon,"" the winner of which will get double his or her earnings. The People's Choice Oct 1, 1994 Screech is looking for more challenging responsibilities, so Mr. Belding makes him faculty advisor for the Bayside Breeze, the school newspaper which needs some livening up. The first big story is about the girls' swim team not being able to go to the tournament finals for lack of money. Screech gives his staff permission to skip Belding's PSAT review and other classes to work on deadline. Mr. Belding has to talk to Screech about him letting students miss so much work. Screech shuts down operations on the paper for a while and leads the PSAT review himself. After the test, the kids trick athletic director Mr. Doyle into admitting how he took money from the girls' swim team for use in other sports. Rachel's Choice Oct 1, 1994 Rachel's boyfriend from college David arrives at Palisades Hills. Now Rachel must choose between him and Brian. Also, Screech takes on the task of making a promotional video for the Country Club. Belding's Prank Oct 8, 1994 It's Bayside's prank day and everyone is playing tricks on each other. But it's no joke when Belding makes the mistake of inviting the new superintendent to Bayside. He cancels prank day but when no one listens it spells disaster for Belding. A Matter of Trust Oct 8, 1994 The male staff is up for bids at the annual charity auction at the Country Club. Rachel, hoping to avoid her recent romantic entanglements, purchases a nerd. Alison buys Brian, making Screech jealous. Megan gets stuck with Bobby. Tommy hopes he and Lindsay don't win the prize, a balloon ride, because he doesn't want her to know he's afraid of heights. Tommy the Tenor Oct 15, 1994 Bobby is trying to drum up interest in the glee club. He gets very little response until the girls see the cute music teacher. Meanwhile, it turns out that Tommy D has a great singing voice, but doesn't want anyone to hear him because he's afraid it will hurt his image. Christmas in July Oct 15, 1994 Palisades Hills' annual ""Christmas in July"" celebration is here, and Screech, Bobby and Tommy D are worried about what gifts they should get for Alison, Mr. Harrington and Mr. Belding, respectively. Megan protests the swimsuit portion of the Snow Queen pageant. Bayside Story Oct 22, 1994 It's time for the big game between fierce archrivals Bayside and Valley, and it turns out that Megan's new boyfriend is the captain of Valley's football team. Farewell Dance Oct 22, 1994 As the Farewell Dance approaches at the Country Club, Rachel is sad to be leaving and Megan can't find a date. Bobby wants to date Michelle, a rich club member, so he concocts phony stories about his wealth. Screech faces a dilemma when Alison is accepted at the Julliard School of Music while he is set to return to Bayside. A Perfect Lindsay Oct 29, 1994 Feeling pressure to live up to an idealized standard, Lindsay goes overboard on her dieting, endangering her health. Also, the TV show ""Club Jam"" is holding a dance contest at Bayside. Brian asks Rachel to be his partner. Brian helps Bobby pair up with Megan, but Bobby has a problem: he can't dance. Back at the Ranch Oct 29, 1994 The gang goes to Screech's Uncle's dude ranch. They make friends with his cousin who picked on Screech when they were little. Gold fever hits the gang when they learn about a treasure. Wanna Bet? Nov 5, 1994 Screech's Uncle leaves the ranch in care of him and Belding. Soon Belding and Screech start competing. When they fail, they give each other the silent treatment. The gang befriends two older boys who let them win at everything unaware that they are con artists planning their next scam. Breaking Up Nov 12, 1994 Lindsay can't afford to buy a birthday present for Tommy, so Brian and Bobby get ahold of the school's video equipment so she can make a video for a present. Meanwhile, Brian's sister Katie, and Tommy are falling for each other. Lindsay and Tommy are looking at the end of their relationship. The Class of 2020 Nov 19, 1994 The gang is interviewed for a film to go in a time capsule to be opened by the class of 2020. Stories are told via flashback. Drinking 101 Nov 19, 1994 Mr. Belding leads the kids on a school-sponsored skiing trip. When they get to the lodge, Brian is more interested in hitting the slopes than being with Rachel, and Lindsay meets a college guy she's attracted to. The girls are invited to a frat party, and they go. While there, Lindsay is offered a beer and ends up drinking too much. The boys come looking for the girls and Tommy D starts drinking also. He and a girl he met take off on a snowmobile. Feuding Friends Nov 26, 1994 Still at the ski lodge, Tommy D has time on his hands after his accident, and he and Megan start to spend some together. They go out on a date, which makes Lindsay and Bobby none too happy. Rachel and Brian also get caught up in the feuding that follows. Screech is chosen by Ramon-Ramon to be his new model, but he doesn't realize that the famous skiwear designer intends to make a mockery of him. To Cheat or Not to Cheat Dec 3, 1994 Rachel must get a ""B"" on a test or she can't go to the Bayside Ball with Brian. Brian sees a copy of the test and tells Rachel what she should study. She makes the ""B,"" but now she thinks she doesn't have to work hard for good grades. Also, Mr. B is doing a performance evaluation of Screech. Screech enlists the kids to help him look good, but his plans keep backfiring. The D Stands for Dropout Dec 10, 1994 Tommy enjoys his mechanic's job at Vince's garage and he's good at it. Vince offers him regular employment. When school starts preventing Tommy from working at the garage as much as he'd like, he drops out so he can work full-time. It's a decision he comes to regret. Goodbye Bayside (1) Dec 24, 1994 Bayside's 40th birthday celebration is in full swing. Bobby is running for homecoming ""king"" against Rachel, who's running for queen. A millionaire alumnus, J. Walter McMillan, comes to tour the school. He plans to buy Bayside and tear it down for condo construction. The gang are all reassigned to different schools. Screech's work program will come to an end and Mr. Belding will be looking for a job. Screech and the kids resolve to stop McMillan. Screech disguises himself as attorneys for both sides and the gang chain themselves to lockers, but nothing works. The school is slated to be destroyed after the prom. Belding's Prize Dec 31, 1994 Screech forgets to mail in Mr. Belding's application to join a prestigious society of principals, so he enlists the help of James the actor to convince Mr. B that he's been accepted. Also, the gang tries to buy the one millionth burger served at the Max so they can win tickets to the MTV Music Awards. Goodbye Bayside (2) Dec 31, 1994 The students are depressed about Bayside's closing and can't get very excited about the prom. Mr. McMillan shows up and says he now plans to tear down the school even before the prom is held. Desperate to stop him, Rachel is disguised as ""Nurse McGillicuddy"" and the kids fake an outbreak of ""Swiss measles,"" for which a phony quarantine is set up. The prom is back on. The gang finds out that Mr. McMillan was a lonely guy at Bayside, with only one friend, a girl named Sandy Bennett. They locate Ms. Bennett but she can't come to Bayside's 40th prom because of a previous engagement with her nephew. The prom has a 1959 theme. Former Bayside High students Lisa Turtle and A.C. Slater show up, then Zack Morris arrives with Ms. Bennett, who it turns out is his aunt. McMillan is reunited with his old friend and she convinces him to abandon his plans to tear down Bayside.